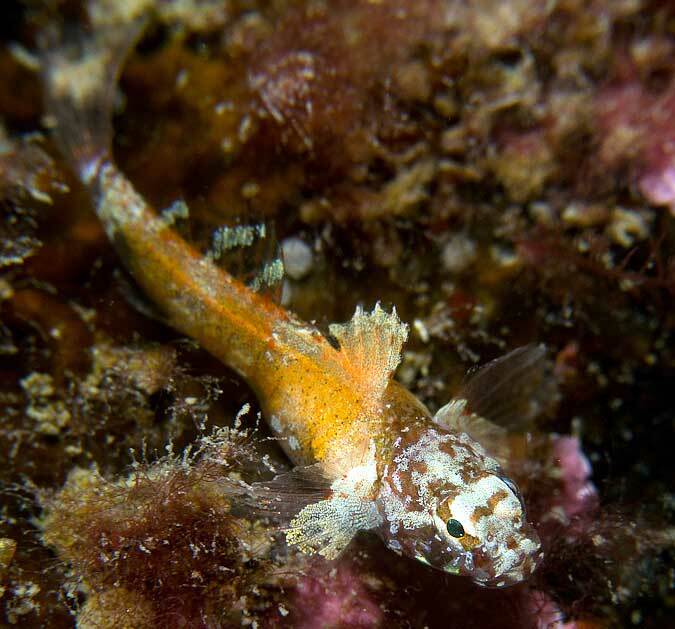 Gobies (British marine species) BMLSS page. Gobies are difficult to identify. Photographs in books cannot be relied upon because the identifications of British species are wrong over 50% of the time. The Common Intertidal Gobies around the British Isles. 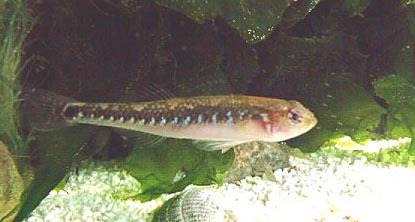 Small goby (a family of small fishes with a notorious reputation of being difficult to differentiate, characterised by a pair of dorsal fins, and a pelvic fin fused into a weak suction cup). Sandy colour, but not so long as the similar species Pomatoschistus minutus. In breeding coloration the male fish has a dark blotch at the rear of the first dorsal fin. Only experienced rockpoolers are likely to be able to separate these species in the wild. Spring. May lay eggs up to five times under a shell. Male guards the eggs. Life span 12 - 15 months only. Habitat: Sandy shallows, intertidal with shallow sandy pools, estuaries in summer. Small crustaceans like caprellids, worms. Sandy colour but longer* than the similar species Pomatoschistus microps. In breeding coloration the male fish has an occelated spot at the rear of the first dorsal fin. Only experienced rockpoolers are likely to be able to separate these species in the wild. *distance from the last second dorsal fin ray to the tail fin is proportionately greater than in P.microps. Habitat: Sandy shallows, intertidal with shallow sandy pools, estuaries in autumn. All British coasts, North Sea, Mediterranean. Gobiusculus flavescens, Two-spotted Goby. Photographed with great difficulty at Tjärnö Aquarium by Mike Noren. A photograph of a shoal of 2-Spot Gobies by Paul Parsons. Small goby, abundant offshore and occasionally stranded in pools. Two black spots can be seen clearly on the transparent boby, one near the head and one near the tail fin. This small fish inhabits the shallow seas below low water mark in rocky areas. Occasionally, it can found on the shore where there is a quick fall off into deeper water e.g. the north Devon coast around Ilfracombe. 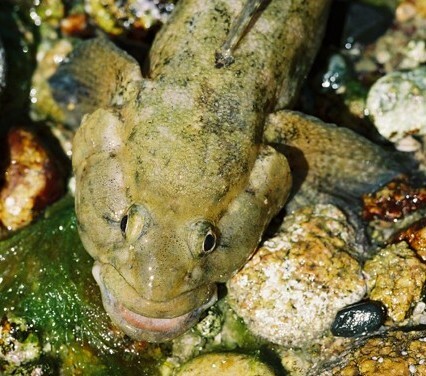 This large goby is a very rare find on the south-west shores of Britiain. It is also known from the shores of both Guernsey (where a specimen was caught in 1994 by an angler that weighed 264 grams) and intertidally on Jersey. Their rarity in Britain is because they are on the northern edge of their natural distribution based on water temperature for breeding. In the south, probably because they are eaten or go into bouillabaisse. Also, their bathymetric zone is probably in shallow water, and not normally intensively fished, and not encountered by rockpoolers except on the low spring tides, or under rocks too large to shift. I found two Giant Gobies, Gobius cobitus. at Roskilley, south of Newlyn; in a small middleshore pool, 100cm x 100cm (open space), no green algae cover, but there was a very deep crevice under a large rock. On watching them I was amazed at how rapidly they can change colour from dark brown to olive green depending on the bottom / from shade to light. They were both easily teased out their hole with a little mackerel flake. On going back up Marazion Beach, south Cornwall, as the tide turned (on the lowest tide of the year) my partner and I looked around some uppershore pools and discovered five Giant Gobies, Gobius cobitus. in three small pools. They averaged about 18 cm in length. I found a Giant Goby, Gobius cobitus, in a rockpool at Portholland beach, south Cornwall. I wasn't sure exactly what it was as it was so large, although I knew it was a goby! Having googled the subject I was interested to see which type it was, and that they appear to be protected. This one was in rude health, and was released of course following some photography. I didn't have the good fortune to have a ruler with me but would estimate the fish to be approx 20 cm long. I have been an avid rockpooler for 40 years and I have never seen one before. 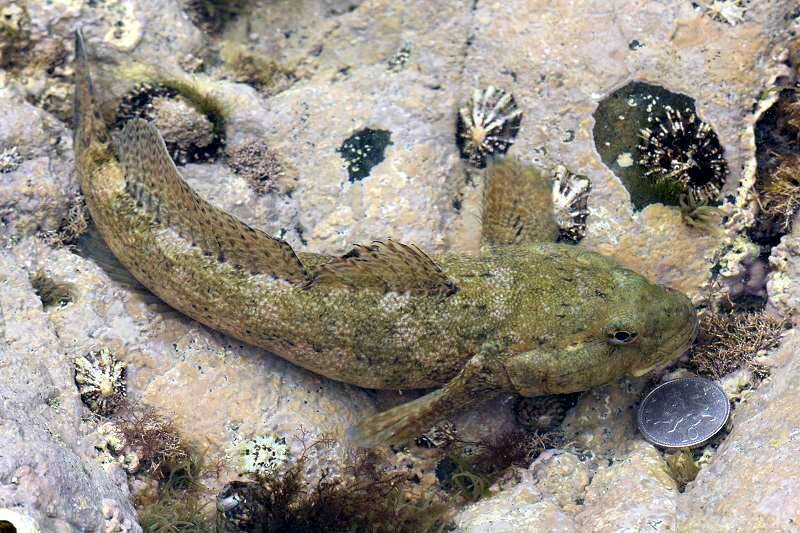 A Giant Goby, Gobius cobitus, was discovered by Jon Makeham at Hannafore Point, Looe, in southern Cornwall. It was found sheltering underneath a piece of Japweed, Sargassum muticum, on the middle shore. 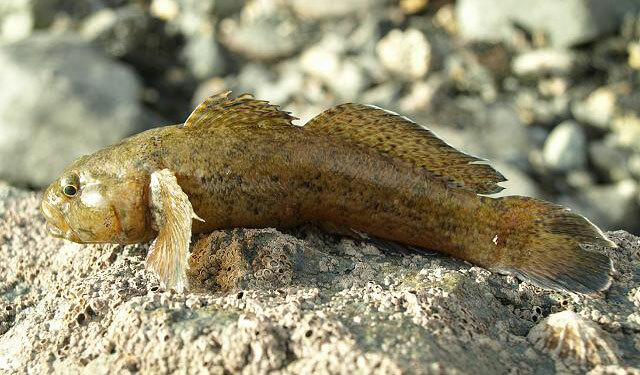 This large goby at 25 cm long, is at the northern edge of its range in the SW of Britain and is rarely found between the tides. This goby is now a protected species (since 1998). 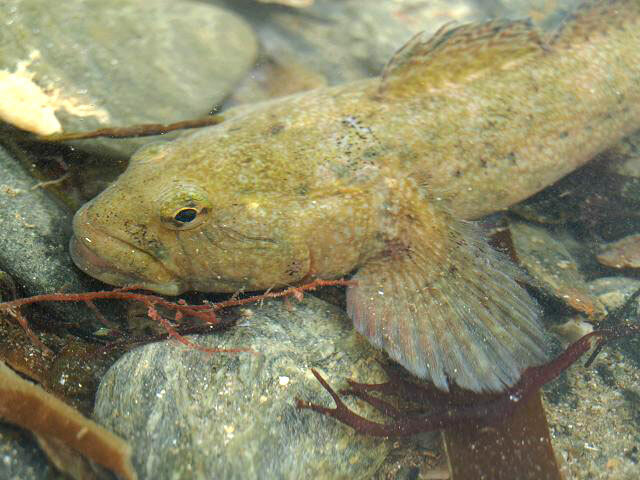 The discovery of a Giant Goby, Gobius cobitis, found in a rockpool above the half tide mark at Les Écréhous, Jersey, was a notable discovery. This goby is a protected species under the Wildlife and Countryside Act Schedule 5. It has always been known from the shores of Jersey but it is virtually unknown on the northern English Channel coasts with occasional records from Cornwall only. 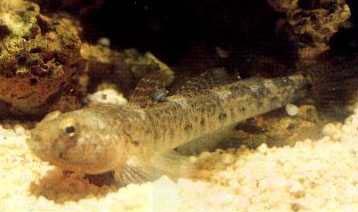 As it name indicates this goby is a 'giant' amongst the Gobiidae, a family of small fishes. 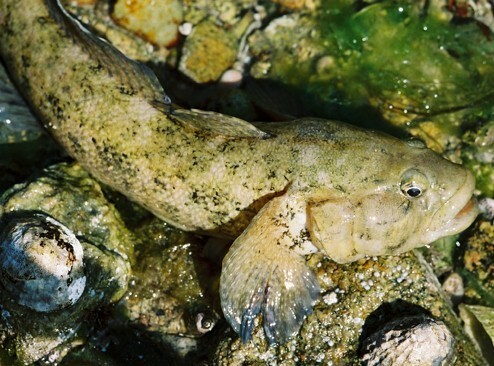 The Giant Goby attains lengths of up to 25 cm. I have photographed a Giant Goby at Pendennis Point, Falmouth, Cornwall. 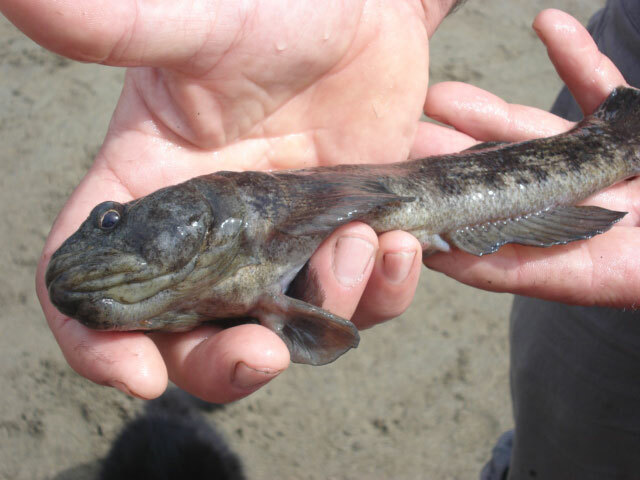 This goby is common in some areas below low tide mark, and conceivably could be discovered betweeen the tides, but few reports of this fish from the shore have been received by the BMLSS. Jim Hall reports this fish on very low tides from Tenby, SW Wales. There are frequent reports from divers from NE Scotland to Devon, so the fish must be widespread below low water mark. Pomatoschistus pictus Painted Goby. Note the two dark band on the dorsal fin. Size about 2.5cm. Photographed at Tjärnö Aquarium by Mike Noren. This goby with a local distribution is so similar to Gobius niger that I cannot distinguish the species. Lesuerigobius friesii have been reported living with the Scampi Prawn, Nephrops norvegicus, in the same burrows. This small fish was originally identified by me as arguably the most attractive of the gobies found around the British Isles: Lebetus guilleti is rarely seen and even more rarely photographed. It has not even got a popular name. This one had attained its maximum size of 25 mm. Lebetus guilleti is a very small fish (possible the smallest in European seas?) has not been recorded between the tides around the British Isles, but it is seen mostly in shallow depth at about 10 metres. It inhabits Lithothamnion alga-encrusted rock areas. There is another species in the genus, Lebetus scorpioides, that inhabits deeper waters. Lebetus guilleti has been recorded from the Shetland Islands to the Mediterranean Sea. More information on this family of small fishes in British seas to follow.